The PGC and PR Unite of the Nigeria Security and Civil Defence Corps (NSCDC) Osun state Command on Friday, went on "Operation Flush out illegal Private Guards" in the state. Many private guards were arrested and sensitisation was made in some private institutions visited. 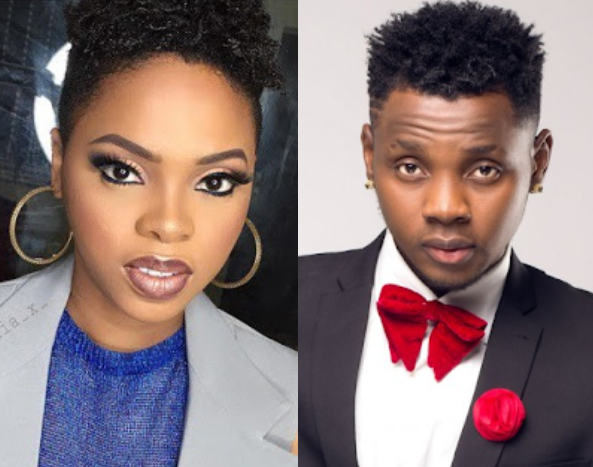 Chidinma Ekile, popularly known by her stage name Chidinma seems to have confirmed that she is dating Kiss Daniel in a secret interview with NET TV where she somehow accepted the singer is her Boo. 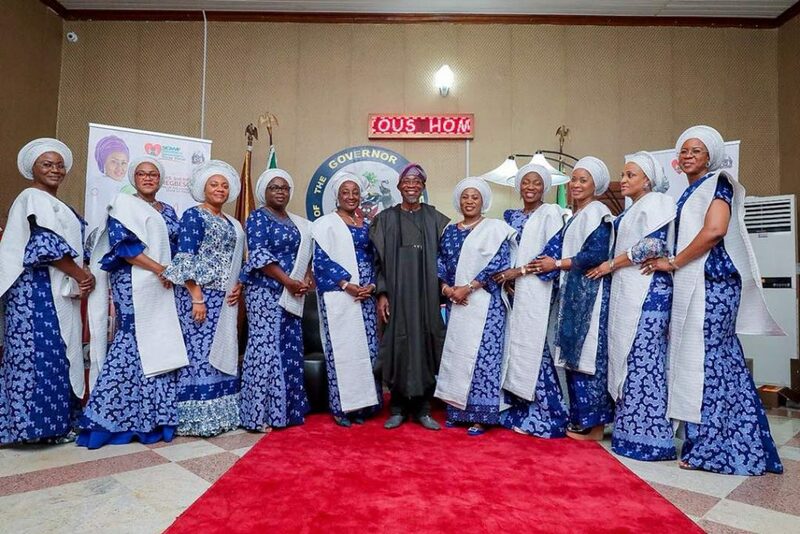 The Southern Governors Wives Forum on Thursday visited Governor of the State of Osun, Ogbeni Rauf Aregbesola at the Government House in Osogbo. They are hosted by the Wife of the Governor, Mrs Sherifat Aregbesola to their annual conference in the State of Osun holding this Friday. Dolapo Julius captured the scenes of the Courtesy Visit. 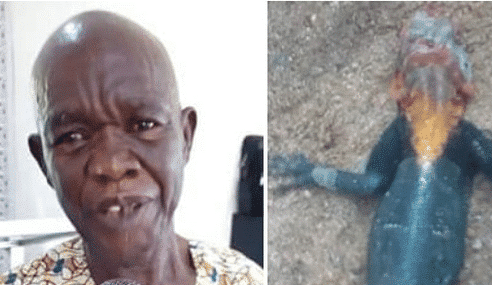 A Nigerian pastor, Rabbai Ephraim Ononye has taken to Facebook where he shared a story of how a man’s brother died after he killed a lizard in the middle of the night. According to pastor, the man suffered witchcraft attack for long before attending his church leading to the incident. Federal High Court sitting in Abuja has nullified the suspension of Senator Ovie Omo-Agege from the Senate for 90 legislative days. Omo-Agege had gone to court to seek redress wherein he filed a suit against the Senate (1st defendant), the Senate President (2nd defendant), and the Attorney General of the Federation (3rd). By the suit marked FHC/ABJ/CS/314/2018, Omo-Agege, representing Delta Central Senatorial district challenged his suspension from the Senate, saying it was illegal. Dayo Adeyeye who was defeated by Prof Olusola-Eleka in the Ekiti Peoples Democratic Party (PDP) primary berates the governor of Ekiti State, Ayodele Fayose for his flamboyant lifestyle. He accused Fayose of using chattered flight he was heading to Abuja but go around Ekiti State in Motor-cycle. Adeyeye said he was leaving the PDP for good but did not announced his next destination but promised to use all he has to liberate Ekiti people from the PDP. “I am leaving the party because the party can change but your state cannot change, the party can change, your hometown cannot change,” he said. The infant's father, 27-year-old Lesiba Motsai, appeared on murder charges at the Mookgophong Magistrate's Court in Limpopo last Friday. Baby Bonolo's grieving mother Modjadji Marikhela, 19, has vowed to avenge her daughter's death if her former partner is released on bail. "I'm heartbroken and I don't know what an innocent baby did to him to be slaughtered like an animal. I want him to die. I don't want to see him again because if he comes I'm going to mobilise the community to kill him," she said. The leadership of a political pressure group founded by former President Olusegun Obasanjo, the Coalition for Nigerian Movement, CNM, Thursday, announced its fusion into African Democratic Congress, ADC. This is with a view to forming a formidable force to wrestle power from the ruling All Progressive Congress, APC in 2019 poll. It was resolved that with the understanding of like-minded persons and organizations across the country, Nigeria will be rescued and that the elections of 2018 and 2019 will be used to cure the curse and afflictions of failed leadership and perpetual underdevelopment. Davido took to girlfriend, Chioma to Abuja few days ago to sign a major endorsement deal for a cooking show. Here are lovely photos from an upcoming TV commercial for the show featuring Davido in a suit and Chioma in a glamorous sequin dress. Members of the road traffic robbers union who specialised in using toys guns to rob people at various bus stops in Lagos have reacted over their ordeal in the hands of the police. P.M.EXPRESS reports that some of the suspects revealed that they had a strong union, territories of operation and rules guiding their members in their operations, and they claimed that they were non-violent “shakara” robbers. The group had suffered serious setbacks last week after FSARS operatives arrested 10 suspects and recovered their toy guns which they used to rob people. The suspects were Imole Otegbeye, 22, Ibrahim Raymond, 28, Mufutau Riwan, 22, Samad Sikiru, 23 and Riwan Abdusalam, 22. Made Men Music Group presents the official video for “JOGODO” by star artist "Tekno". The video was Directed by "Clarence Peters". Davido may be rolling in cash right now but he has taken out time to reply to a follower who claimed that himself and girlfriend Chioma made over 480 million Naira on their new endorsement deals. Video: Woli Agba Gets Electrocuted Because Of Debt..
Toyin Afolayan born 24th September 1959 popularly known as Lola Idije is a Nigerian film actress and aunt to Nigerian film actor Kunle Afolayan. She shot into limelight after starring as Madam Adisa in a 1995 film titled Deadly Affair. She has been featuring as an actress for close to three decades. She is regarded as one of the pioneers that made modern Yoruba films production blossom. PANICKED passengers were forced to scramble over the wings to get of their jet after it filled with smoke. Travellers could be heard yelling “let us out” after Delta flight 1854 touched down in the Mile High City. Dramatic video captured on the plane shows cabin crew ordered people to remain low in their seats and cover themselves in a blanket before the order is given to "evacuate, evacuate". Two young herdsmen were spotted sucking cow breast, along Karu road, Gidan, Mangoro, Abuja. This activity which was secretly photographed by a stunned passer-by has caused an argument on social media. The standoff between the Senate and the Inspector General of Police (IG), Mr Ibrahim Idris, took a turn for the worse Wednesday when the upper legislative chamber declared him “an enemy of democracy” and as someone “who is unfit to hold public office” in Nigeria and abroad. But the police IG said he owed no one an apology for discharging his duties and accused the senators of blackmailing him into perverting the course of Justice because of Senator Dino Melaye (Kogi APC). Inspector General of Police (IGP) Ibrahim Idris Reacts To Nigerian Senate Declaring Him An Enemy Of Democracy. The Inspector General of Police has reacted to the resolution of the senate to declare him an enemy of democracy unfit to occupy any public office in Nigeria or outside the country. The senate tagged the police chief an enemy after he failed to appear before the house for the third time. He was expected to address the house on the controversy surrounding Dino Melaye's arrest as well as the killings happening in some parts of the country. After he failed to honor the invitation for the third time yesterday, the Senate in an executive session, resolved to tag him an enemy of democracy. Enam Heikeens, a nurse from Ghana suffers from rare Vitiligo skin condition. Apart from Vitiligo patients, their family members are also constantly battling with the social stigma attached to the disease. The young lady took to Instagram to post a photo of herself with her mother to celebrate the woman for bravely enduring the social stigma. Here's the burial poster of the 50-year-old lawyer, Mr Otike Odibi who was killed by his wife in Diamond Estate, Sango-Tedo area of Ibeju Lekki, Lagos State last week. The wife who is also a lawyer, Mrs Udeme Odibi, allegedly stabbed her husband to death in their apartment. A man has been charged with three counts of battery after he got in a fight with six police officers. 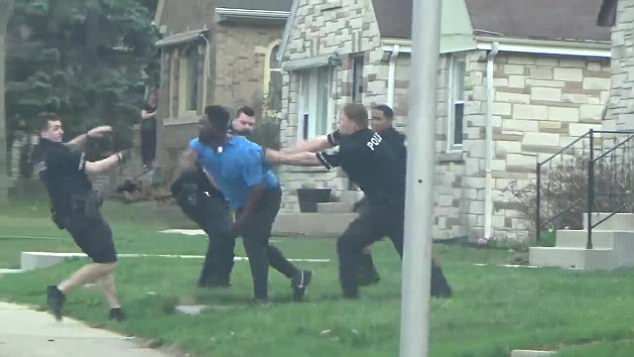 A video of the brawl between the officers and Demetrious Lowe, 25, on a street in Milwaukee, Wisconsin, has gone viral. The video goes back and forth between the officers violently hitting Lowe with police batons and Lowe approaching them with his fists curled and blood streaming down his face. At least three of the officers were injured and Lowe suffered several broken bones in the incident, which Lowe's family says was an unusual mental health episode. He said the aspirants noted that the “Direct Primaries” would enable every card-carrying member of the party vote for the candidate of their choice. 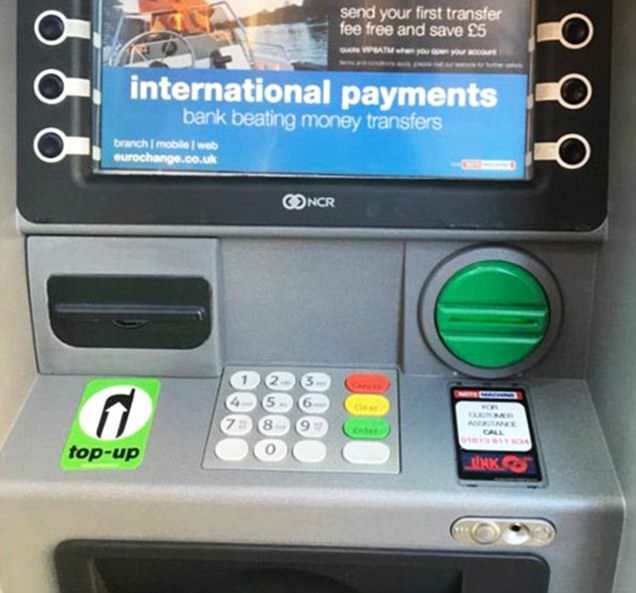 Bank customers are being warned to be extra careful when using cashpoints after an off-duty police officer discovered a near-invisible hidden camera in one machine. The cashpoint in Westminster looks almost identical to any other of the hundreds in use around the country. But a special constable from the Met Police managed to spot the tiny device which was positioned to film customers putting in their pin numbers. Despite undue pressure from top politicians in Imo state,Gov. Okorocha is determined to make his son-in-law Uche Nwosu next Imo governor. While addressing a group of people,he described his people as being myopic. He also used Tinubu and Saraki to explain why his son-in-law should be governor. Ogbaji Comfort got pregnant out of wedlock and gave birth to a baby girl. This angered her parents and her mother placed a curse on her. Both parents abandoned her and refused to sponsor her education. But she worked to see herself through school, according to a story she shared. I have been a member of @rccghq for close to 20yrs so I will call out @ProfOsinbajo for the embarrassment he has become to the Body of Christ. Watching as Christians get killed daily. If it hurts you, tell him to resign as a pastor so I can face him as the politician he has become. As it is well known that the Primaries Election for the People Democratic Party held today in Ekiti state. The battle was between Professor Olusola Eleka (Current Deputy Governor to the state) and Prince Dayo Adeyeye as Senator Abiodun Olujimi, a senator representing Ekiti South constituency has stepped down for former Minister of Works, Prince Dayo Adeyeye. It's the most coveted night in the style calendar with fashion fans around the world keeping their sartorial eye on all the red carpet moments. 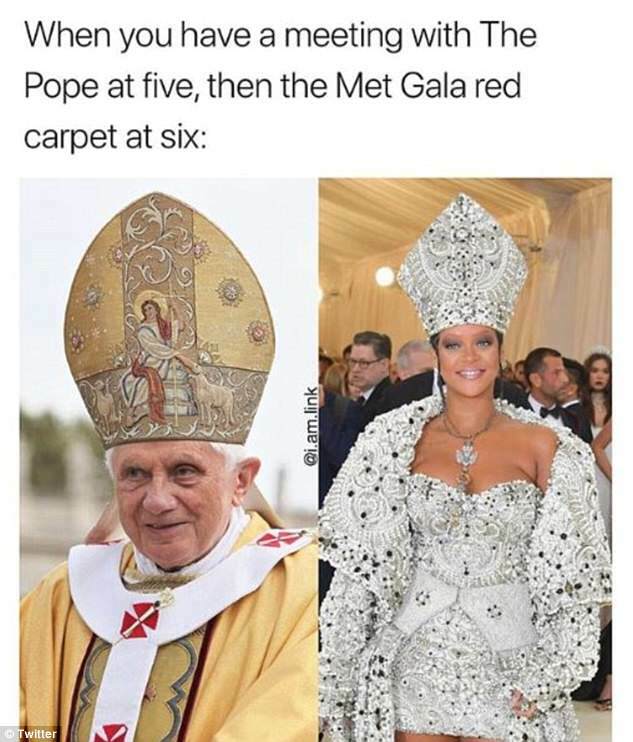 And while many haven taken to social media to share their fashion envy, other Twitter fans have reacted hilariously to Monday night's Met Gala in New York by sharing a multitude of rib-tickling memes and commentary about the night's biggest fashion misses and hits. Comedic fans ribbed usual Gala goers Beyonce and Lady Gaga's no show and playfully referred to them as the 'Holy Ghost' at the event, which followed the theme Heavenly Bodies: Fashion & The Catholic Imagination at this year's Costume Institute Gala at The Metropolitan Museum of Art. 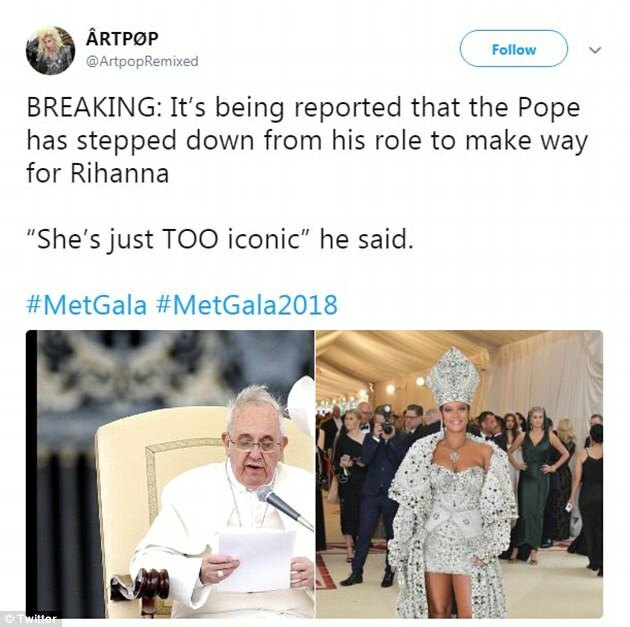 Rihanna sparked a religious backlash and divided fans after she channelled Pope-chic for the annual Metropolitan Museum of Art’s Costume Institute Ball. The Barbadian superstar made sure to stick to the Heavenly Bodies theme in a heavily embellished custom-made John Galliano gown complete with crosses and a papal inspired headdress. 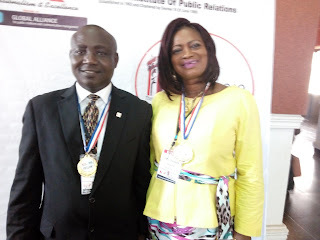 Country Representative - Nigeria of The Banker Magazine, Financial Times, London, United Kingdom, Mr. Kunle Ogedengbe has been decorated with the Fellowship Gold Medal of the Nigerian Institute of Public Relations (NIPR), a chartered body of public relations practitioners in Nigeria at the 2018 Conference and Annual General Meeting of the institute in Umuahia, the capital of Abia State recently. Ogedengbe who is also the Managing Director/Principal Consultant of PR Plus Consulting Limited has over 26 years experience in media, public relations, advertising, research, strategy, corporate planning, marketing and academics. He set up the public relations department of MTN Nigeria and was at various times Heads of Corporate Communication and Strategy at Sovereign Trust Insurance Company Plc where he was also Secretary of Top Management and UnityKapital Assurance Plc (now Veritas Kapital Assurance Plc) apart from being Advertising Manager at Chellarams Plc. According to reports by @emmaikumeh on twitter. One of the offa's robbers is a former police officer identified as "Michael Adikwu" he was dismissed by police in Ilorin for misconduct in 2012. "This is Michael Adikwu, a constable whom I tried, and was dismissed by Police, in Ilorin for misconduct, 2012, was amongst the Offa robbers. He's arrested now by Kwara Police yesterday." The psychiatrist in a recent interview with Daily Independent said the major cause of mental challenge in Nigeria has gone beyond drug abuse as the youths now inhale lizard faeces as well to get high. The Popular host of political talk show.."FOCUS NIGERIA" which airs every weekday between 10am to 11am on AIT has been relieved from anchoring the show, Gbenga Arulegba made this known in a series of tweet released from his official twitter handle @gbengaaruleba..No official reason has been given for this sudden development. Few hours after we reported that Chioma Avril, Nigerian superstar, Davido's girlfriend has secured her N60million deal in Abuja, her boyfriend has disclosed that her cooking show 'The Chef Chi Show', will be aired soon. Nollywood actress Mercy Aigbe says she's totally Blown out with the way Davido shows the world how much he loves Chioma, The Mother of 2 who is battling with Divorce from her Husband after been battered last year, Shared a photo from the scene of the Endorsement deal for the Cook Show Davido Arranged, And said a Good Man Empowers and supports his woman. This must have touched her deeply. After the recent curse Gov. Nasir El-Rufai sent on all his three Senators, he further questioned their indigeneship to Kaduna State. Sen. Shehu Sani took to Facebook to upload pictures of his late father when Sen Sani was a baby and his photographs during official functions. Under the post he wrote : "ANYONE WHO IS OF A GENUINE ANCESTRY OR BEING PROUDFUL OF INTERACTION WITH WHITEMEN SHOULD POST THE PICTURE OF HIS FATHER"
Would El-Rufai respond? We wait to see. Comedian Otolorin Kehinde aka Kenny Blaq has arrived into the world of successful Nigerian entertainers. Kenny Blaq who began his career about six years ago can beat his chest now to say he is successful and we would believe him without much fuss. 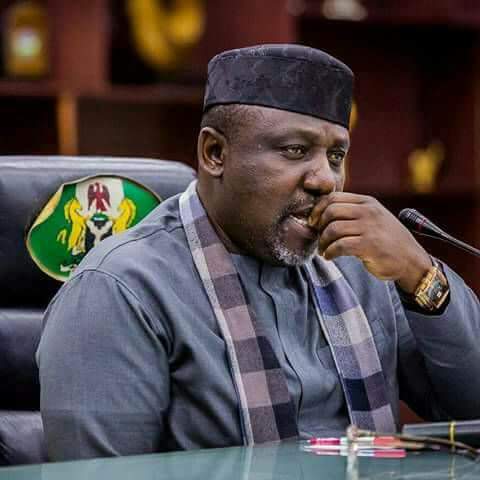 The governor said the way he managed the situation saved the state from “a very big crisis” it would have been thrown into Governor of Imo state, Rochas Okorocha on Sunday, May 6, ordered the arrest and arraignment of the committee members sent to monitor the All Progressives Congress (APC) ward congresses on Saturday, May 5. Daily Trust reports that Okorocha took the action, despite the state chairman of the party, Hilary Eke and the state organising secretary, Clement Chijioke Anozie, rating the exercise as successful in all the 305 wards in the 27 LGAs of the state. Nollywood actress, Eniola Badmus cruising in a Rolls Royce in grand style to Ghetto Bred London Premiere. Pamela added that in Canada, you will have to start all over because your professional qualifications and work experience don’t count. Davido has reacted to the pictures of his girlfriend Chioma and Controversial ex-big brother Naija housemate cee-c. The multiple award-winning singer appears to share the sentiments of a large portion of fans who believe that the two ladies look alike. 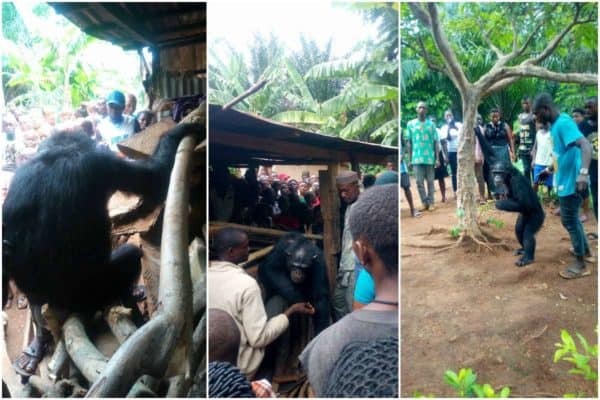 There was reportedly commotion in a village in Cross River state last weekend after a gorilla living in the wild met a farmer in the bush and followed him home. It was reported that residents of Bitiah Irruan village in Boki LGA of Cross River State all gathered at the farmer’s home to witness and see the animal for themselves as many said such incident has never happened before. Trying to figure out why the gorilla followed the farmer home, some said it was possible the animal no longer had food in the bushes, so he followed the man home, hoping to get food from there. Others insinuated it could be a sign of favour to the farmer, another said the gorilla lost his way while moving from Bumaji village to Bitiah where an NGO takes care of them.